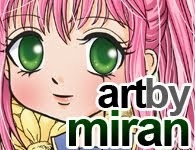 Hello, Welcome to our Artbymiran blog!! I am so excited to welcome all of our followers to our blog where we will be sharing our love & creations and new releases with you!! If you have been following us during our soft opening these past two weeks, you have met my wonderful designers, Susan, Vicky, Angelique, Desire, Ruza, Judy, Amanda and Jackie. 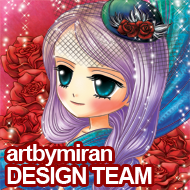 art by offering a chance for you to select some of my wonderful images to create with. Would you like a chance to win 5 images of your choice from my store! I will select 10 winners, each who will win 5 images of their choice!! What do you need to do to be in the draw you ask? For each share above (4 opportunities), leave a comment below for each one you shared and your name will be entered into the drawing. Winners will be announced on January 16th here! Here is a little token of my appreciation to you! To save the image, right click on the image and select save to your computer. She is a token of my appreciation for becoming a follower of my blog. Remember to tell your friends to stop by become a follower and grab our freebies for themselves. No file sharing please and please abide by Angel Policies. Thank you and enjoy! share her with me on my Facebook page!! Congratulations on your new blog and shop! Fabulous artwork. I shared on FB, became a follower, and liked your FB page. Saw the advert from the fabulous Desire who is also one of my DT members. Good luck with this venture, and thanks for the first freebie! Thanks so much Margy for hopping over. Thank you very much for this lovely freebie. I am already a follower of your blog and facebook page. I have shared your poster on my blog http://granmargaret.blogspot.com.au/ and my facebook page. Already following you Miran. Thanks so much for the freebie, she is adorable. Thank you for the freebie, I am already a follower! Thank you, Mi Ran. I love her. Oh, I forgot to say that I was already a follower and liker and I shared and and invited friends. Sweet thanks, will get her all dolled up! Thank you for the fabulous freebie. 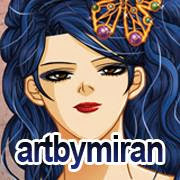 I am already a facebook follower and have favorite your etsy shop and a follower of this blog. Thank you so much for the freebie!! I have already been a follower of your facebook and etsy and this blog--just I hadn't joined the following button before today. I can't wait for pay day to purchase some more of your images as I just adore them!! Can't wait to color up the freebie!! Thanks again! Thanks so much for the great freebie! I am a follower of your blog. I shared your poster and a link to the giveaway on my Facebook page. Thanks for the freebie.I have done all 4 request. already liked you r facebook page, joined your blog thank you so much for the image... she will be fun to play with.. added to blog and putting on facebook... I am so Happy for you! Congrats!! 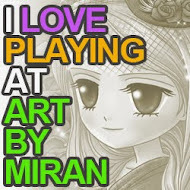 Thank you for the fabulous image! I think she will be so much fun to color. I have liked your FB page, shared on mine, and become a follower of your blog. So happy for you, congrats! Thank you for Rosie, she is beautiful. Thanks for the fabulous image!! Sounds exciting! Congrats on your new blog! Thanks for the image. I'm a new follower. Thanks so much. I'm now following your blog. Thank you. I am following your blog and sharing on FB..This is awesome! Thank you so much! Love this! I am a follower, Liked your FB page and showcased this on my Blog. :o) Hugs! Thanks for the freebie Mi Ran! I have filled the 4 opportunities… Congrats for the new blog!!! I love your images! I've seen some that Jackie has colored and shared on FB, and they're all so cute! Congrats on your new blog...I'm now following it! I don't have a blog, but I just shared your poster on my FB page! Thanks for the chance to win some of your images! This is so lovely. Thank you so much for the fabulous freebie.. Thanks so much for sharing Rosie with us. I have liked your FB page, shared the poster on my blog, shared the poster on FB and I am a new follower!!! Thanks so much!! Thank you for a stunning image! I am a new follower, I have also shared on Facebook. Your design team are fabulous. Congrats on your new adventure, and of course for the beautiful gift of your work. I will be a follower on your Facebook page... good luck and Happy New Year! Congratulations on your blog. 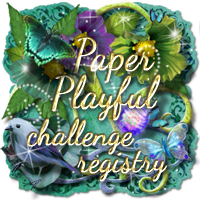 Vicky and Susan have shared your amazing images and I'm so excited to have the freebie. Thank you!!! I've become a follower. I've put a link on my public facebook page along with your poster. 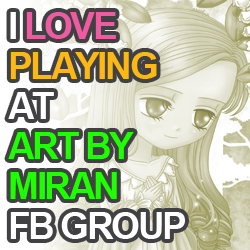 I've also LIKED your FB page and will place your poster on my blog. Good luck, congratulations and thanks. Thank you for the beautiful freebie! I am now a follower of your blog. Back to say I have shared your poster on Facebook. I have liked your Facebook page, too. Thanks for the chance to win! Shared your poster on my Facebook Page! Just became a follower of your blog! Beautiful artwork! And I also shared about your giveaway on my FB account! Love your images, thank you for this opportunity! Thanks for the freebie! You have some fabulous stamps! Can't wait to use some of these. THANKS! Beautiful, follow on FB and shared. And the freebie, Rosie is super cute! I can't wait to color her up! :D already imagine her in red and gold *agh I really love to go with those two lately, LOL. Following your blog via Google+! 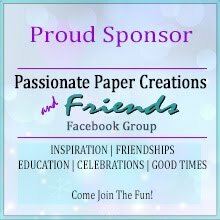 Liked your FB page as well as following your blog. Tx for beautiful freebie! ...and I totally like your FB page already! ♥ Happy New Years! I shared the poster on facebook. And last, but not least, I shared it on my blog. That's four. Thanks. WAUW thank you soooo very much for this cute freebie here Rosie, she´s absolutely gorgeous. I saw about this site from a couple of friends, and I love what I saw here, your images is awesome, and I have signed up as a new follower, but I´m not on Facebook, so unfortunately I can´t follow you there ordo anything, but I´ll add you to my blog a bit later today, I promisse. Have a wonderful day and good luck with everything new here. wow!!!! thank you so much for the giveaway!!!! I've become a FOLLOWER, I love your designs!!! 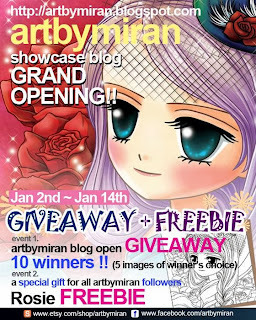 I have also shared your giveaway on my blog! and I have become a FOLLOWER ON FACEBOOK!!!! 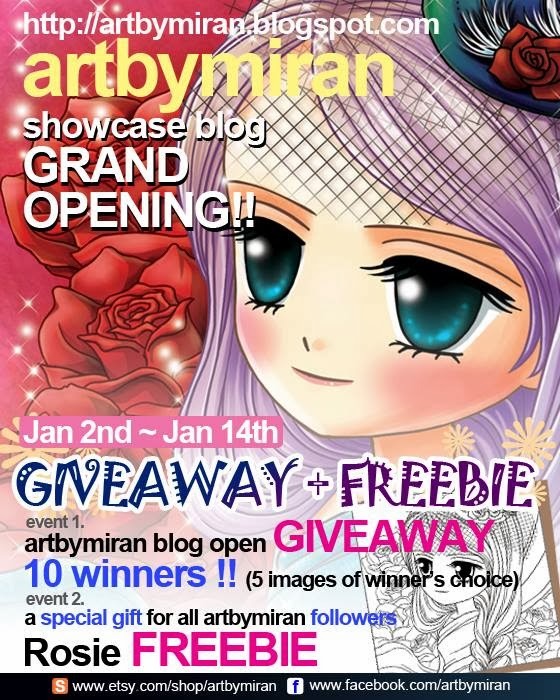 and I have shared your blog and giveaway with my FB friends!!!! Stunning image and amazing artwork. Thanks for the fabulous freebie. New Follower. I am a follower of this blog :). Became a follower of your blog (found you through the Love to Create Challenge blog). Shared your poster on my Facebook. Beautiful images, I have missed the deadline but will still share etc. Thank you she is beautiful. I am a new follower.